Standing at a hundred years’ distance from this early 20th century photograph, I finally see the women who stood close by and just out of frame as the photographer set to work that day. Informed by a history I was never taught and having recently become a grandmother myself, I finally sense the influence in this photograph of my grandmother and her mother. Their presence, standing unrecorded outside the limits of the lens, is as certain to me as the image of my father and his brother, little boys at play in a child sized grocery store, which this photograph portrayed and passed on to future generations. Sometime in my teen-age years when I first saw this image, I was intrigued to see my family name “Gretsch” coupled with “Sommer” the name of my father’s cousins whom I barely knew. I remember asking questions. The answers were as vague to me then as the image I had of my grandmother Charlotte Sommer Gretsch who died long before I was born. This clear photograph of the “Gretsch Bros.”, my father and my uncle, playing in the “Branch Store” of the real life market of their grandfather “Sommer Bros. 910 6th Ave.” in the “City” of Manhattan, is mesmerizing in its detail. 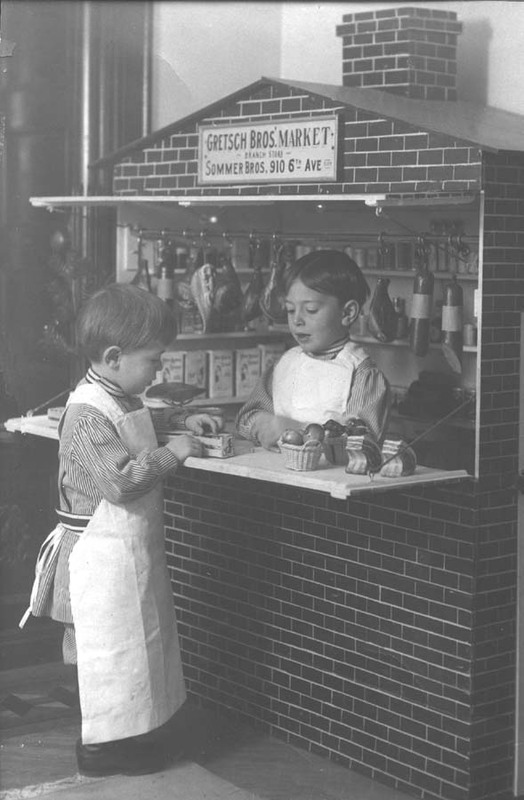 The toy sized grocery store is set up indoors, in what was at the time the family home of the “Gretsch Bros.” on President Street in the Crown Heights section of Brooklyn. Highly polished and fluted woodwork reaches up along one edge of the image, past the faux brick chimney of the playhouse and out of frame. Just below the woodwork, a small section of the rich parquet wood floors on which the playhouse rests is visible and suggests that this little market enjoys a very certain comfort in its Brooklyn surroundings. This elegant setting is mirrored in the polite interaction of the two exquisitely groomed and uniformed little grocers. Freddy, the oldest boy has thick dark hair much like his mother’s. My father, Willie Walter, is blond with fine hair as straight as my own. The boys are outfitted in matching tailored, heavy cotton, pin stripped tunic shirts and knee button pants. Long white aprons, emblematic of the grocers they pretend to be, complete their costumes. Just as clearly as I see the elegant woodwork stretching out of frame, I visualize my grandmother standing silent and also graceful at a close distance from the scene. While Charlotte watched the photographer arrange and rearrange the cumbersome lights around her two oldest children, she was also listening carefully for the sounds of her youngest waking from his nap. No doubt, the outfits of her sons reminded her of other boys who in her own childhood were similarly dressed. First, her older brothers, Philip and Louis and then her younger ones Charles, John and Leo, all worked through the years of their childhood at their father’s market on 6th Ave. Charlotte, the only sister, was surely in charge of mending and maintaining her brothers’ “grocery boy” uniforms. It was not difficult for her now to recreate these costumes brand new for her own little boys. Perhaps, Charlotte’s mother, Theresa, sat close by watching the photographer work on that winter day of 1910. The boys’ grandmother must have wondered at the casualness and ease of modern photography. For Theresa, just the possibility of having pictures taken in one’s home would have seemed a modern miracle compared to the days when her own children were young. Theresa’s memories of this family market stretched further back in time than those of her daughter. Theresa remembered easily the small family owned “eating house” or restaurant on 8th Ave. and later the butcher shop which preceded the finally successful “Sommer Bros. Market” of her husband William and his brother Louis. Remembering the struggles of these earlier businesses and watching her young grandsons playing in the stylish rooms of this modern Brooklyn town house, Theresa may have been reminded of long ago rooms not so well fashioned which encircled the play of her own children on 9th Ave. in Manhattan just on the outskirts of Hell’s Kitchen. Surrounded by her only daughter’s children and the wonders of modern life, Theresa may have also recalled her daughters born before Charlotte, daughters who did not survive their infancy. One, Theresa’s first child, Susan Regina, was named after both of her grandmothers, Susanna Mayer Leicht and Regina Winklein Sommer. The other, Theresa, was named in honor of her mother. These sisters who Charlotte never knew were daughters that Theresa would never forget. There is no Christmas tree in this photo. However, the winter dress of the boys and my own memory of other German Christmas scenes with children playing happily beneath a tree, leads me to imagine that this child sized grocery store had recently been a Christmas gift. Such a special present might easily have been designed with the boys in mind and then assembled by one of the many skilled craftsman employed at their father’s musical instrument factory on South Fifth Street in what was then called the Eastern District of Brooklyn. As children, these “Gretsch Bros.” would play at being grocers but the real work of their adult lives would be in their father’s music business. In the years surrounding the taking of this picture, the boys’ father Fred and his brother Walter were busy with plans for erecting an even larger factory on Broadway not far from their first joint building venture on South Fifth Street. Both of these modern structures were completed very soon after the opening of the Williamsburg Bridge in the same neighborhood. In the first decade of the twentieth century, this new bridge quickly brought business opportunities from Manhattan to this once distant part of Brooklyn. Both new factories built by the boys’ father and uncle were signs of the success of this once small family business and both buildings proudly bore the name “Gretsch” high above their many stories. The sign which hung above the toy market, however, clearly points to the importance of another family business across the East River in Manhattan. At the same time that the Gretsch history was being writ larger everyday, it was Charlotte who supervised her children’s play and it was most probably Charlotte who saw the importance of connecting her children with the family history which she remembered on the other side of the Williamsburg Bridge. Encircled in my childhood by a proud Gretsch legacy in which my grandmother Charlotte’s voice is silent, it is not hard to imagine that her life was surrounded by a long series of unrecorded efforts and responsibilities. Following backwards on a path of influence which stretches into the modern life of mothers and grandmothers, it is quite possible to see that it was my grandmother who supervised the building of the tiny market in this photograph…she who composed the wording of the sign which hung above the market, connecting her sons to their history in Manhattan…she who had the sign painted…she who arranged the photographer’s visit. After the photograph was taken, it was Charlotte who ordered duplicate copies of this formal record of the existence of the Sommer Bros. grocery store, the only record which would be passed on to future generations. For without this long ago photograph, I would have never asked the questions which have lead to my discovery of the forgotten family history in Manhattan. It was Charlotte who placed the photograph prominently in the center hallway of the family home on President’s Street, thus preserving a small piece of family history long after the Christmas presents of 1909 were forgotten.